Officer in the French army, and communal worker; born at Mutzig, Bas-Rhin, in 1776; died May 11, 1840. He took part in the early campaigns of the empire, at first with the cavalry, then with the infantry. He was commissioned at Cassel in 1809 to organize the army of Westphalia. Returning to France after the fall of the kingdom of Westphalia, he settled at Paris (1813), entering the service of the government. 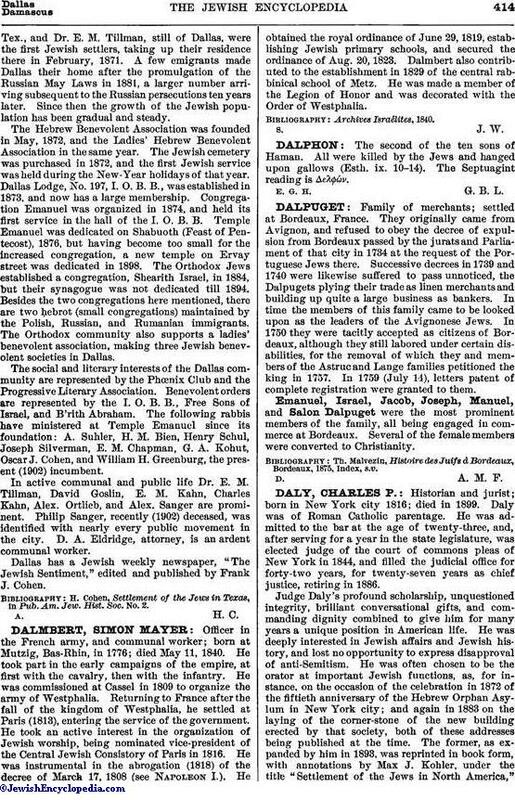 He took an active interest in the organization of Jewish worship, being nominated vice-president of the Central Jewish Consistory of Paris in 1816. He was instrumental in the abrogation (1818) of the decree of March 17, 1808 (see Napoleon I.). He obtained the royal ordinance of June 29, 1819, establishing Jewish primary schools, and secured the ordinance of Aug. 20, 1823. Dalmbert also contributed to the establishment in 1829 of the central rabbinical school of Metz. He was made a member of the Legion of Honor and was decorated with the Order of Westphalia.